Lexington, Kentucky may be considered to be the “horse capital of the world”, but this grand southern city is also home to great people, lovely homes, and bustling businesses. At Action Pest Control we have developed pest control programs that will meet the exact needs of Lexington property owners, protecting property and people from the threats that common Kentucky pests can introduce. Whether you are looking to protect your property from ants, spiders, bed bugs, termites, roaches, or rodents we have an effective, discrete, and affordable solution for you. Contact us today to learn more about our local company and our tailored solutions to Lexington area pest problems. When we think of pests we hate, often what comes to mind are spiders or mice, but have you ever stopped to think about termites? Termites are small insects who make their home inside the structure of your's, they cause extensive damage that can cost you thousands in repairs, they live i colonies that can number into the millions and they are just plain gross. Certainly topping my list of pests I hate are termites, but with Action Pest Control homeowners in Lexington can rest assured no termites are making your home their own. Offering effective termite treatments in Lexington, Action Pest is an industry leader in identifying, eliminating and preventing termite infestations. If you suspect these pests have moved in, contact Action today! To learn more about any of our customizable pest control programs and/or to determine which program is the right choice to protect your Lexington home from pests; give us a call today. Are There Bed Bugs In Lexington, KY? The simple answer to the question of whether or not there are bed bugs living in Lexington, Kentucky is yes, yes they are! Bed bugs are prolific pests that are found living in close proximity to people all across our country and the world. Bed bugs live and breed near people because their favorite source of food unfortunately happens to be human blood. This means that bed bugs are found where large groups of people travel on a regular basis, in places like hotels, motels, event centers, libraries, schools, dormitories, movie theaters, hospitals, nursing homes, and really any other public place. Bed bugs are a difficult pest to prevent against because they are found living in so many of the places that most people commonly frequent. While bed bugs are a difficult pest to treat, they are not impossible to eliminate from properties, especially if you partner with the bed bug control experts at Action Pest Control. If you ever spot bed bugs inside of your home, immediately contact us so that we can start working to completely eliminate the infestation from your home. At Action we can eliminate bed bugs through the use of our K-9 bed bug detection dogs and our bed bug heat treatments. To learn more, give us a call today! At Action Pest Control we are so successful at controlling pests in commercial facilities because we work closely with our customers to rid commercial facilities of pests and to create an environment within the facility that won’t attract future pests. Our highly trained, qualified, and experienced pest professionals provide exceptional pest protection inside of any commercial facility by implementing our 10-step preventative pest management program. This highly effective program includes the following services: Inspection, Monitoring, Identification, Sanitation, Exclusion, Harborage Reduction, Mechanical Controls (traps), Environmental Controls, Product Application, and Documentation. All these services work together to ensure that your commercial facility is no longer a place that pests will want to or be able to live. To put into place our highly effective 10-step preventative pest management program and protect your Lexington business from a dangerous and damaging pest infestation, give us a call today. If you are experiencing any of the following things/signs on, in, or around your Lexington property, you need to immediately contact Action Pest Control and schedule a termite inspection. The appearance of termite swarmers; swarmers are winged reproductives that swarm from a mature termite colony in order to mate and start a new nest. The most common sign of a swarm is finding their discarded wings in piles around window sills, doorways, and on decks and walkways. Wood damage on outdoor items like fences, patios, decks, and outbuildings. Discovering the mud tubes that termites travel through on basement walls, foundation walls, inside of crawl spaces, or running along the ground towards your home. Structural damages inside of your home like windows and doors that no longer open and close properly or floors that are buckling and feel spongy when you walk across them. To protect your Lexington property from termites and the significant structural damages that they can cause, put into place a comprehensive termite solution from Action. 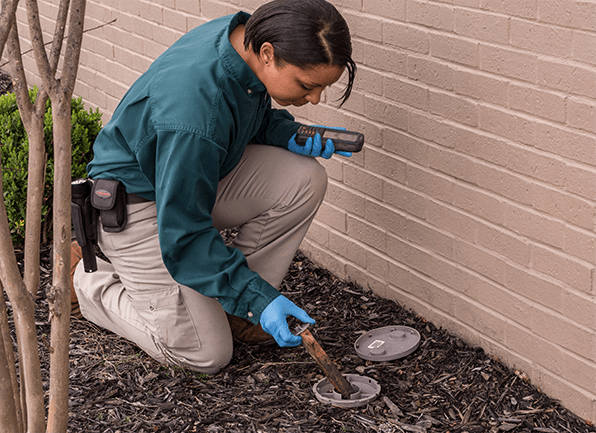 Our Five-Step Termite Control System includes a comprehensive inspection and the treatment of the infestation using Termidor®. We then follow-up with a three-month termite elimination inspection and an annual termite inspection to make sure that these damaging pests do not return. To learn more about our termite services, including our money-back guarantee and damage warranty, click here!